The SaraSpa Clubhouse building is the nerve center of our operation. Member access is controlled by and electronic key entry system. The Clubhouse is fully heated. The meeting area is used for monthly meetings of the Board of Directors. The area is also used for training courses held as SaraSpa. 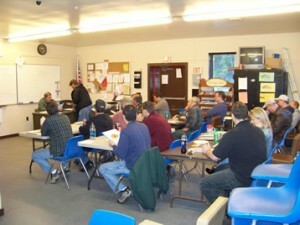 The photo is from the October 2, 2010, NRA RSO Course. The meeting area features a large selection of firearm and hunting related magazines, catalogues and other literature. Thanks to the generosity of two long-time benefactors of SaraSpa, in the Fall of 2009 we had a new entryway installed on the clubhouse. The installation was just in time because the new entryway kept water from running off the roof and forming ice at the entrance. 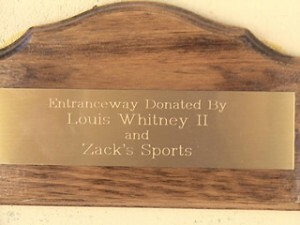 Special thanks to Louis Whitney II and Zack’s Sports for giving the club a truly inspiring edifice. Mark Pepper of Cabin Creek Builders, as always, did a first rate job of construction. 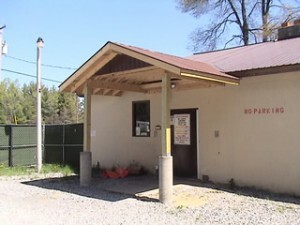 I do not know if you noticed, but as of Spring 2010, the SaraSpa sign on the clubhouse was looking pretty ratty. What to do? Well – engage internationally recognized local artist, amazon, and bon-vivant Elyse Byrnes to paint a replacement of course! Elyse did not disappoint, the new sign (installed Sept 1, 2010) is shown below and is truly a wonder to behold. Members present at the sign-raising wept openly – it was an event that changed us all. Ms. Byrnes is spending the 2010-2011 year in Osaka, Japan, but she did pause for a few comments on her work before boarding the plane on August 25, 2010. The deer hunter is modeled after Hollywood favorite Steve McQueen. The model for the fisherman was not named, but Elyse confessed he had a dark and sordid past. The fish is a brook trout, the state fish of New York. When asked about the significance of the rock, Elyse simply responded, “I like rocks, they are very reliable.” True dat. 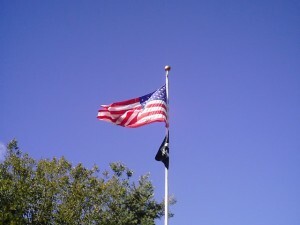 On September 11, 2010, SaraSpa raised the flag of the United States on a new flag pole. Visit the Open House 2010 Page for a description of the raising ceremony as well as acknowledgements for all those that helped. We fly “POW-MIA” flag as well.